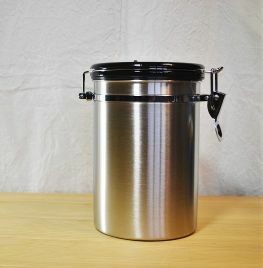 The Friis Coffee Vault is a storage canister for coffee beans or ground coffee. But it's more than that because its design takes into account what we know about coffee and how it reacts to light, moisture, and air. These are the enemies of coffee so your storage solution should not be clear, or allow air in, or moisture. The Friis Coffee Vault is a simple well designed storage canister which blocks out moisture, light and air to hold coffee flavour better. It also has a valve which allows CO2 and any trapped air to vent away. Holds either coffee beans or ground coffee in a stainless steel container with traditional clasp to bring a tight seal on closing. Handy number dial so you can record the day of the month you filled up the Friis Coffee Vault. Comes with 6 spare valves, so if you feel that one is 'tired' you can replace with another. Keep you coffee fresher with this specialist solution to coffee storage - the Friis Coffee Vault. Approximate capacity estimated at 450g.